Signups for 2012-2013 Rotary Year. 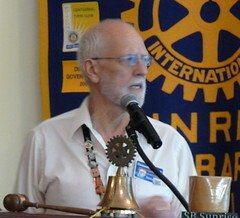 David Velarde asked members to sign-up for responsibilities for the next Rotary Year. A sign-up sheet was passed through the club. Want a week in Mexico? There will be a private e-bay auction of an entire week at a fantastic resort in Mexico. Joanne Schoenfeld and Stuart have donated their resort time as a fundraiser for our charitable foundation. The auction will end at the time of the golf tournament (May 21) with the goal of significantly increasing funds raised. Recognition of Whittier Camp renovations. Debbie Hib provided a plaque to Sunrise Rotary and expressed sincere appreciation for the improvements at the camp sponsored by Rotary. Read more by Betsy Munroe on Noozhawk. Golf tournament is Monday, May 21 at Glenn Annie golf club. We now have 96 golfers. Tri-county office furniture has donated a chair again for closest to the hole. We are in very good shape. Please continue to solicit silent auction items. Get your silent auction items to Andrew Chung. 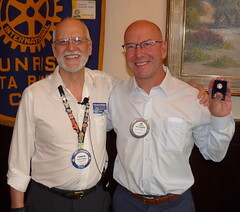 Induction of new member Jeff Boehm – Jeff is now our newest member. 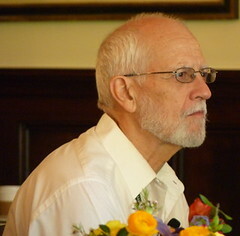 His induction was witnessed by his dad and grandfather, both fellow Rotarians, and his mother. International Rotary Convention in Bangkok. Many of our members will be representing our club at the conference later this month. Tuesday Rendezvous – There was a great show last night. Graham Guess’s band also played at the club. Program: Elizabeth Garcia presented Engineers Without Borders on behalf of our club’s International Service Committee. Janet Napier introduced Elizabeth Garcia: Elizabeth moved to California in September 1999 to earn her bachelor’s degree in Environmental Engineering from Stanford University. Since graduating in 2003, she worked as a water resources engineer for the San Francisco District of the Army Corps of Engineers and, recognizing that exploring science is what truly made her happy, returned to school in UC Santa Barbara’s top-ranked Geography Department. She is currently a doctoral candidate studying forest ecohydrologic processes in the mountainous western U.S.
Elizabeth joined UCSB’s Engineers Without Borders team in September 2011 for several reasons—including the desire to lend her education to a project larger than her typical interests and culture, to meet others at UCSB who want to do the same, and, as a 4th year PhD student, she relishes the feeling of beginning and ending a meaningful project in less than 1 year. Engineers Without Borders has 12,000 members at 250 universities and professional organizations working on 350 active projects. Elizabeth shared what Engineers Without Borders has done in Kenya since 2008. She showed photographs of the area near Lake Victoria – the town of Mbita and village of Luanda – where EWB has done several water projects, electrified the Viagenco Clinic and built an incinerator for medical waste. Our Rotary club financed the large Opanga borehole water project and the incinerator. She mentioned that the incinerator was not working well when it was first built in 2010, but the team that returned last year fixed it. This year they will be working on a water filtration system for the Nyatemba area near Luanda which, once again, Sunrise Club is helping to fund together with the RC’s of Montecito and Fillmore Sunrisers as well as other sources. Following the presentation, Joe Weiland called Janet Napier to the podium as well as Susan Saperstein and Holly Gendron from Visiting Nurse & Hospice Care of Santa Barbara. Both women were presented with Paul Harris Fellow honors. In 2004, Susan and Holly attended a conference where they heard about partnerships through the Foundation for Hospices in SubSaharan Africa. They requested that VNHC become a partner hospice and were assigned Viagenco Comprehensive Care in Mbita/Luanda, Kenya. Mbita has one of the worst rates of HIV in the world. Since then they have raised funds and made four site assessment trips to Kenya. Viagenco now has a fully operating health clinic and home-based palliative care program which serves the entire community. As they pursued the health care project, they realized how many children had been orphaned by HIV/AIDS and started to sponsor 150 of them to attend school. About 25 have graduated from secondary school now, and three students are attending college on scholarships. They started a microfinance program which the community then took over. They have sent people from the village to study permaculture and they have started a demonstration garden which has encouraged people to utilize sustainable agriculture in their home gardens as well. They are now working on an exit plan, which means that they have been so successful with this project that they will begin to wean funding for the operation of the clinic and encourage self-sustainability. Minutes submitted by Susan Klein-Rothschild, Janet Napier and David Vo. Thank you.